This beautiful animal was once widespread over the Ethiopian plateau lands and was often observed by travelers with its fine red coat shining in the sun, making it easy to spot against the greens and browns of the grasslands. Its frightening decline in numbers is due not only to indiscriminate shooting, but also to outbreaks of rabies, which certainly decimated its numbers in the Simien area. 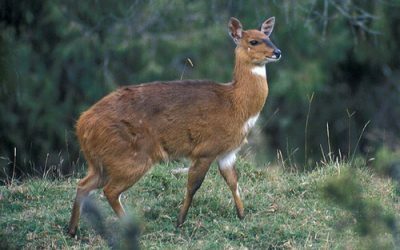 In this part of Ethiopia it is now extremely rare, even rarer than the Walia Ibex, but it has another stronghold, in Bale, which the Walia doesn’t. Its restriction to these two areas is not fully understood, as it is not considered that it was so extensively hunted throughout its range that it should have been unable to survive in the thousands of hectares of suitable “fox country” available. It is one of most beautiful and spectacular members of the dog family in the world, with its bright rufous coat, white under markings and black tail, stands about 60cm high making it significantly larger than any Jackal, and has along muzzle similar to that of a Coyote. It has predominantly. It is a diurnal hunter of Afro – alpine moorland and short grassland, where its feeds mostly on rodents including the giant mole rat.